It is a privilege to capture such a special day with my watercolours. 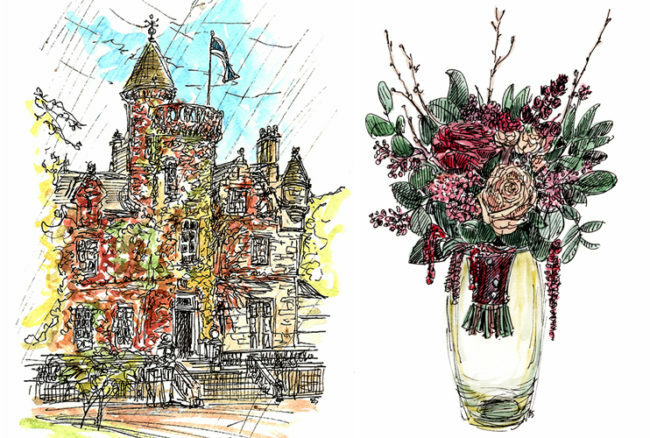 As a wedding sketcher I attend the event and move around in the background drawing the details which catch my eye, like the flower arrangements, personal decorations, architectural details and colourful guests! Slightly nervous at first I always relax into it once the first sketch is done, and soon have a sketch book full of pen and watercolour illustrations which capture the day in an original way. Key locations or events to sketch during the day can be discussed before hand but I always like to draw the ceremony and venue exterior. Above are a few of my wedding books which I have printed with all the sketches and some hand written notes for the bride and groom. Originals and prints can also be purchased as part of the tailored service. 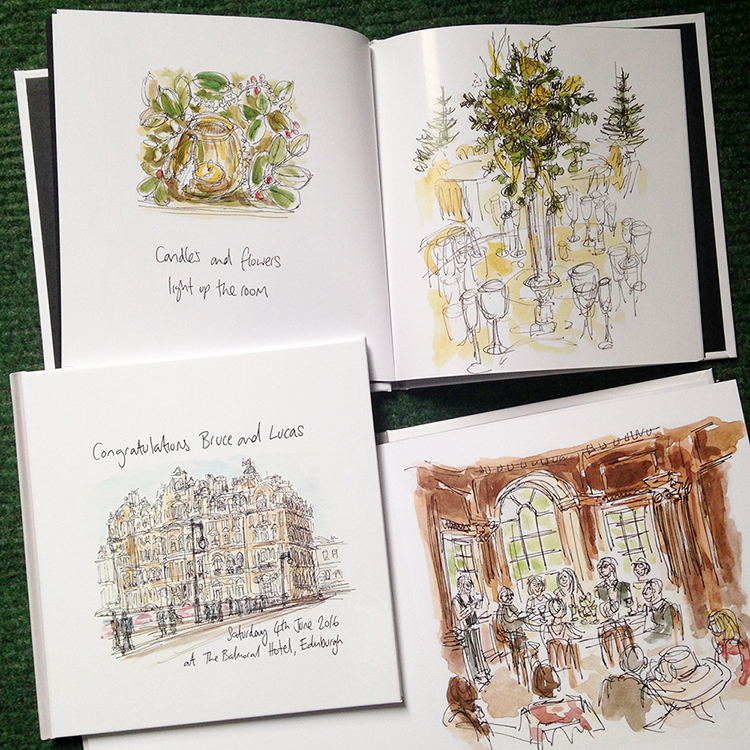 A Wedding Sketcher package creates a personal, original memory of your special day, and also can be a perfect present for the bride and groom who have everything! Thank you for your message, I will send you an email shortly with more details and examples. I am getting married at Dundas Castle on August 29th this year and would love for someone to come and sketch a still from our wedding reception. I live in the USA and we saw the idea at another wedding and loved it. Can you give me an idea of pricing and what exactly you could offer us? Hi Tracy, thank you for getting in touch. I will send you an email today. I am looking for a wedding gift for a friend. She is getting married at St John’s Church (1a Lothian Rd) in August. I would love to give her a sketch of St Johns Church for her wedding present. She isn’t getting married until August of this year. Is it possible please you can contact me to let me know if this is possible? Thank you for your time in getting back with me. Hi Annabel, I have sent you an email. We met briefly at the Hopetoun House wedding fair a few weeks ago. I wonder if you could email me some further information (packages/prices etc.) and whether you would be available for a wedding on Friday 14th August 2020? Hi Zahra, thanks for your message. I will email you today. Could you please email me more information. I’m interested for our wedding on July 6th. Thank you for your enquiry, I will email you shortly with more details. I am looking to speak to someone potential regarding some wedding sketches. You had attended the wedding of Pauline & Ian Fox a couple of years ago and put together a wedding album of the day for them. If you could email me or contact me on xxxxxxxxxxxxxx. You should of had an email from me, let me know on here if you need any more info in case my email is bouncing again. Thanks, Mark. Can you send me details of wedding packages. Thank you for getting in touch, I will send you an email with more details. in the 18th August 2018. Is there any ideas that you have and are you available in this date? Thanks for getting in touch and yes drawing from photos after the event is something I often do. Prices start at £65 for a small A5 sketch but I will put some more prices together and email you shortly. I am interested in wedding sketches for a wedding anniversary, so they would be from the professional photos that were done. Is that something you would be interested in doing? I love your work. If I ver make to Edinburgh, you are on my list! Thanks. Thanks for your comment, and congratulations. I will drop you an email with more details shortly. I am getting married in December 2018 in Edinburgh and we are looking about for ideas and we are interested in your sketches book for our wedding day. Would it be possible to have a idea of your prices and would it be beneficial for us to meet to discuss ?